At Preservation Treatments (Surrey) Ltd, we are always trying to stay ahead of the competition regarding products and quality of installation. 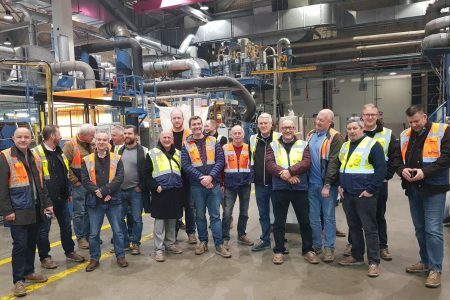 In the early part of December we were invited by Delta Membranes to Germany to visit the Dörken factory where the Cavity Drain Membranes are manufactured. It was a very informative trip where we learnt about the manufacturing process and the different types of plastics used to make the membranes. In the UK we actually have the highest possible specification for the quality possible (even higher than the spec in mainland Europe). It is made from three layers of plastic, vacuum moulded into 20mm studs on a fantastic machine, making an incredible 36m² per minute. These machines run 24 hours a day, 50 weeks of the year, only stopping to be serviced, which is a 2-week process! The product we use is made from virgin HDPE (high density polyethylene) with multiple stabilizers added to ensure that VOC (Volatile Organic Compounds), Free Lime and Temperature have a minimal effect on the material over a long period of time. We also learned how the material behaves when subject to fire. Interestingly, it is not combustible, it will just melt, which is useful to know! It is important to use a surveyor who is a member of the PCA (Property Care Association) Waterproof Design Register, who will know that the design process must take into consideration the drainage runs to ensure the potential spread of any fire is restricted. We are proud to know that the materials we are recommending/specifying are the best quality available, providing protection for periods far greater than our guarantee!